the nOATbook: How to finish your workout with a tabata bang. 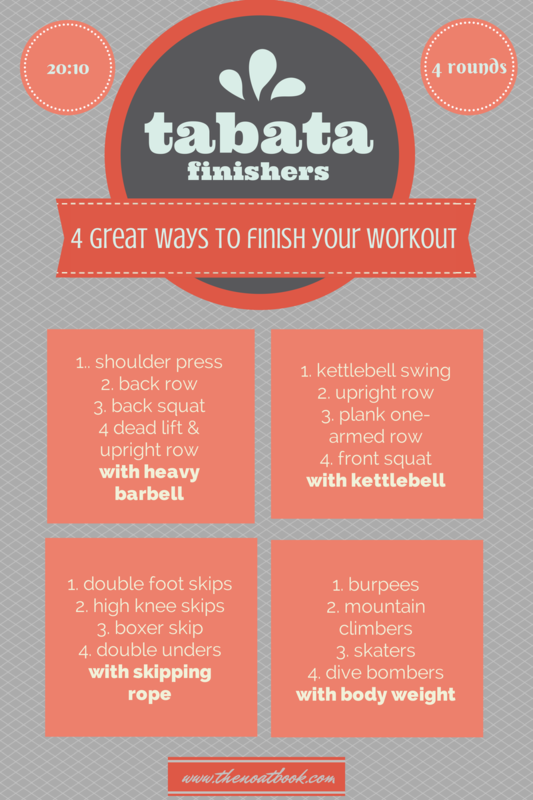 How to finish your workout with a tabata bang. I may have taken my own advice about being allowed to eat twice as much of my Healthy Apple Crumble Slice a little too literally, so I tried to keep up with my workouts up this week. I managed four sessions; three group classes (BodyPump, BodyCombat & Plyo Grit) and of my own HIIT sessions. 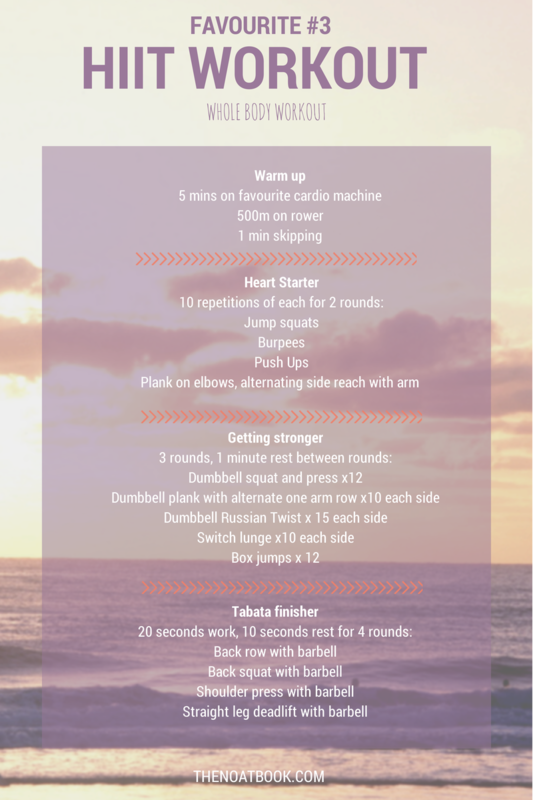 I wasn't feeling 100% and this workout was a good 'in-between' level of intensity; enough to release the endorphins but not so intense it wiped me out for the rest of the day! I did 5 minutes walk/jog on treadmill and did my 500m row in 2:05. I aim to get it done in 2 minutes, so I've got to get a little tougher! I used 7 kg dumbbells for the strength exercises, a 3kg medicine ball for the Russian twists (I should have used a 5kg, it was a little light) and the step for box jumps was above knee height. I used a 20kg barbell for the tabata exercises. 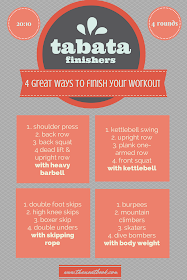 Tabata is a type of interval training that uses 20 seconds of work followed by 10 seconds of rest. You repeat this until you reach a total of eight minutes of work. I like to include it as I enjoy the change up of shorter interval. When you get used to doing 50-60 second work intervals, 20 seconds feels quite short and so you feel like you can lift the intensity. I like to use the 8 minute block as a high intensity finish to a workout. I've complied a few of my favourite 'Tabata Finishers' below using my Gymboss Interval Timer set to 20:10 for 16 rounds. 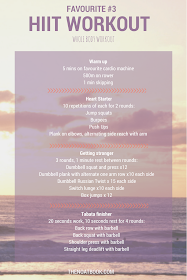 Tell me, what is your favourite way to turbocharge your workout? Linking up with Healthy Habits at Katie Did What. Thanks Leslie, I have fun putting them together. I hope you enjoy the finisher tonight.